FIRST ARMY'S FIELD ORDER I had provided for extension eastward of its offensive, with the last stage to be a coordinated attack by three divisions through the hills protecting St-Lo. First scheduled for 9 July, the attack east of the Vire was postponed two days and thus coincided with the enemy's armored blow at XIX Corps' right flank. This made 11 July a critical day for both opposing armies; in the outcome, Seventh Army was the clear loser. The new attack of First Army was delivered on a ten-mile front,  with the main effort by the 29th Division aiming at the ridges along the St-Lo-Bayeux highway and then at St-Lo itself. (See Map V.) On its right, the 35th Division was to exert pressure between the Vire and the Isigny-St-Lo highway; its objective was the right bank of the Vire, in the elbow made by that winding stream just northwest of St-Lo. Advance here would help the 30th Division on the other side of the Vire, by covering its flank along the river. 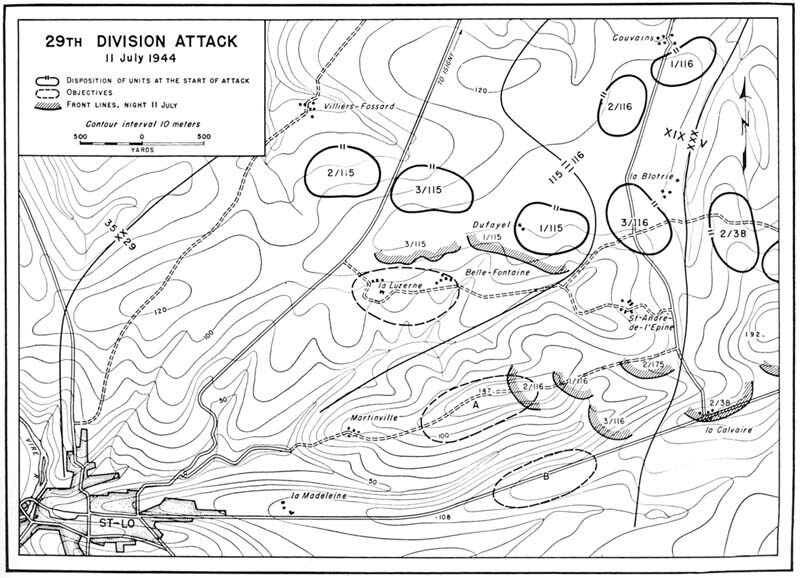 On the 29th Division's left, an assault against Hill 192 would be made by the 2d Division of V Corps. Capture of this dominating observation point would be of prime importance in the attack on St-Lo. The terrain in the new zone of battle was typical hedgerow country, broken into innumerable small compartments of field or orchard by the bush crowned earthen dikes three to five feet thick and six to nine feet high. Many routes used by farm traffic consisted of narrow sunken lanes, walled in by the hedged embankments and forming natural lines on which to organize defensive systems. Observation was always a major problem for troops attacking in this country, especially when observation was needed for regulating the fires of supporting weapons or for coordinating air strikes. As a result, a few of the low hills had considerable tactical value. Particularly important were Hill 192, the narrow east-west ridges flanking the highway to Bayeux between Hill 192 and St-Lo, and the high ground on which lay the village of la Luzerne, two miles northeast of the city. It should be noted that the 30th Division was scheduled to play a part in the coordinated blow delivered on 11 July by XIX Corps. Panzer Lehr's counterattack upset the timing of the 30th Division's effort though the attack was carried out later in the day. For purposes of clarity, the events of 11 July west of the Vire have been dealt with in the previous chapter; from a technical viewpoint, they should be considered as a part of the present chapter. Eastern boundary of the corps sector was at the Drome River, about five miles east of Hill 192. 266th Division; and the group comprising the 352d Division remnants was estimated (7 July) as amounting to only 800 men. Artillery was believed to consist of twenty-four 105-mm gun howitzers, twelve 150-mm howitzers, one battery of 150-mm Nebelwerfers, and two batteries of 88- mm guns. There were no known armored reserves behind 2d Parachute Corps. The battle east of the Vire on 11 July opened early in the morning and, unexpectedly enough, with small but severe German attacks at two widely separated points. Within a few hours, it was apparent that these were limited local efforts to rectify defensive lines, and had no connection with Panzer Lehr's major attack beyond the Vire. But for those hours the situation was unclear, and higher command echelons had to figure on the possibility that the enemy was attempting to throw XIX Corps' new effort off balance. Seventh Army reports the battle group of this division as 2,000 men on 29 June, This figure, however, was quoted just before a hard two-day battle at Villiers-Fossard, in which the 3d Armored Division made a local attack to straighten the XIX Corps front, and in which losses were severe on both sides. a gap between A and B Companies. The commander of Company A was stunned by a grenade, the CP was overrun, and two platoons were reported cut off and destroyed. Company B lost some positions, and both units were fighting desperately in small detached groups, with no coordination possible. Major Johns had no reserve, his communications were out, and Regiment (with all three battalions on a front so broad that a gap of 600 yards separated the 1st and 3d Battalions) was equally impotent. For two hours, rear CP's were receiving alarming rumors, heightened as some Germans penetrated to the mortar positions and drove back their personnel. Col. Goodwin Ordway, Jr., commanding the 115th, organized some of the retreating weapons men as infantry to protect the rear areas. On his left, the 116th Infantry was alarmed by the possibility of a breakthrough in the gap between its units and the 115th and took steps to fill the hole with Company A. Enemy artillery fire ranged into the 116th's assembly areas, causing about 30 casualties. But the attack did not spread beyond the sector of the 1St Battalion of the 115th, and by dawn the 1St Battalion had weathered the storm. Cut off and apparently surrounded, the remnants of A and B Companies had held their positions; with coordination and direction impossible from higher headquarters, "NCO's and lieutenants, gunners and privates, fought in small groups and won that battle." By 0730 the enemy had given up and retired. The 1St Battalion lost over 100 men; the Germans (reported by a prisoner to be attacking in strength of four companies) lost about the same number. The 1St Battalion, scheduled to jump off at o600 in the 29th Division's attack, was delayed several hours by the necessity for reorganizing. Suggesting to some of the participants that the enemy had been informed of the 1st Battalion positions by a German medical officer who came into their lines on 9 July, under a truce, to bury German dead . to avoid costly street fighting and believed the Germans would be forced to evacuate, since the American troops threatened to encircle St-Lo and held all the surrounding hills. 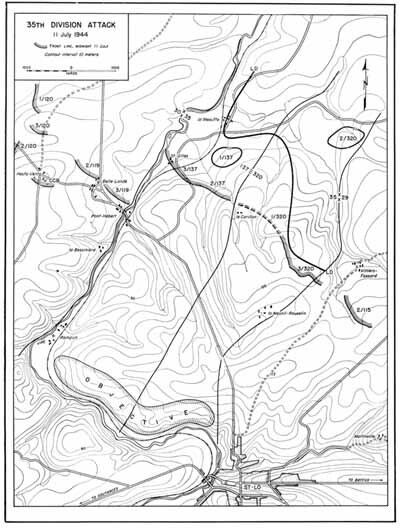 On the right, the 115th Infantry was assigned the area of la Luzerne as objective; its action would protect the flank of the main effort and threaten the enemy with loss of the high ground north of St-Lo. Initially in division reserve, the 175th Infantry was held ready to exploit successes achieved in either of the regimental attack zones. Five battalions of artillery, two light and three medium, were to give support for the attack, beginning with a concentrated preparation between H-20 minutes and the jump-off at o600. The 29th Division had already had much and bitter experience of the difficulties of hedgerow fighting and to meet them, like other units, spent a great deal of time and effort in planning and training for the big attack. Under the direct supervision of Brig. Gen. Norman D. Cota, Assistant Division Commander, the infantry, tank, and engineer elements of the division rehearsed (in fields near Couvains) a tactical procedure for reducing the effectiveness of hedgerow defenses. Particular attention was paid to the necessity of training infantrymen to cross the open centers of hedge-bordered fields, rather than moving along axial hedgerows. This method of maneuver aimed at avoiding enfilade fire along the axials; in the past squads and platoons had been too often pinned down by German automatic weapons that were usually set up at field corners. from the 121st Engineer Combat Battalion. The 2d Battalion (Maj. Sidney V. Bingham, Jr.) of the 116th was to lead off the advance, hitting along the axis of the Couvains-la Calvaire road, skirting the division boundary, and bypassing strongly organized enemy positions at St-Andre- de-l'Epine. The 2d Battalion would start on a two-company front (E and F Companies); each assault platoon in these companies was teamed with a platoon of medium tanks from the 747th Tank Battalion. The plan for the opening phase involved operating in small teams, each with a comparatively broad front: one infantry squad and one tank per field, and a squad of engineers to each infantry platoon. and must rely on the fire power of tanks and infantry for protection. The test of plans and training came in the attack of 11 July. In the first few hours, things moved very slowly, and the situation looked unpromising. The effects of the heavy concentrations of artillery, preceding the jump-off, seemed to be minimized by the hedgerows; at any rate, the 2d Battalion encountered immediate and determined resistance from the prepared enemy positions along the first hedgerows. Mine fields and booby traps were encountered, and flanking fires came from St-Andre- de-l'Epine and the Martinville Ridge. The attacking troops experienced the old difficulty of spotting the exact source of enemy fire. It was only after severe fighting that the 2d Battalion got past the first main obstacle, a sunken road heavily protected with antipersonnel mines. But once beyond this, the assault troops began to find grim evidence of the work of American artillery in the large number of enemy dead and wounded scattered through the next few fields. This, as an observer noted, was an unusual sight, because the Germans ordinarily evacuated casualties before they were reached by our advance. The 2d Battalion kept the pressure on. By 1100, with heavy support from artillery and effective use of the methods for getting tanks through embankments, the battalion was six hedgerows beyond the LD. The engineers of Company B, 121st Engineer Combat Battalion were helping the infantry through mines, and the 4.2 mortars of the 92d Chemical Mortar Battalion were holding down the German fire from the Martinville Ridge (Hill 147). A German self-propelled gun on the north-south highway had lost a duel with our tanks and was left behind, wrecked. Only 600 yards had been gained, but enemy resistance suddenly eased, then cracked. Major Bingham's troops now made rapid progress until they reached the junction of the ridge road leading west toward Martinville. Here the battalion wheeled right, on a 90-degree change in direction of attack. The enemy was still hanging on, southward, and the exposure of the battalion's left flank during the turn made for rough going. Nevertheless, the troops were able to push forward astride the ridge road. So far, the attack had made excellent progress. The infantry later gave much credit to the work of supporting tanks, which had speeded the advance. As always, the tanks had drawn enemy artillery fire, but their use of prongs to break through embankments had saved much time as compared to the sole use of demolitions. The 116th was also greatly aided by the fact that its axis of attack lay along an enemy boundary between units, the 11 and 111 Battalions of the 9th Parachute Regiment, where the defensive positions were not well consolidated. 2d Battalion, and was moving through St-Andre-de-l'Epine toward objective area "B" on the Bayeux-St-Lo highway, near the corps boundary. This move would protect the south flank of the 2d Battalion during its attack west. The 1st was right behind the 3d, prepared to pass between the other two when the occasion offered. The 175th Infantry was still in reserve, but was alerted for possible use along the corps boundary. To the east, the 2d Division was having enough success on Hill 192 to remove any serious worries about the left flank. The going was harder as the day wore on and as the leading battalions neared their first objectives. As late as 1920, General Gerhardt gave orders to "push on, if possible take St-Lo," and all units pressed hard until darkness forced a halt. 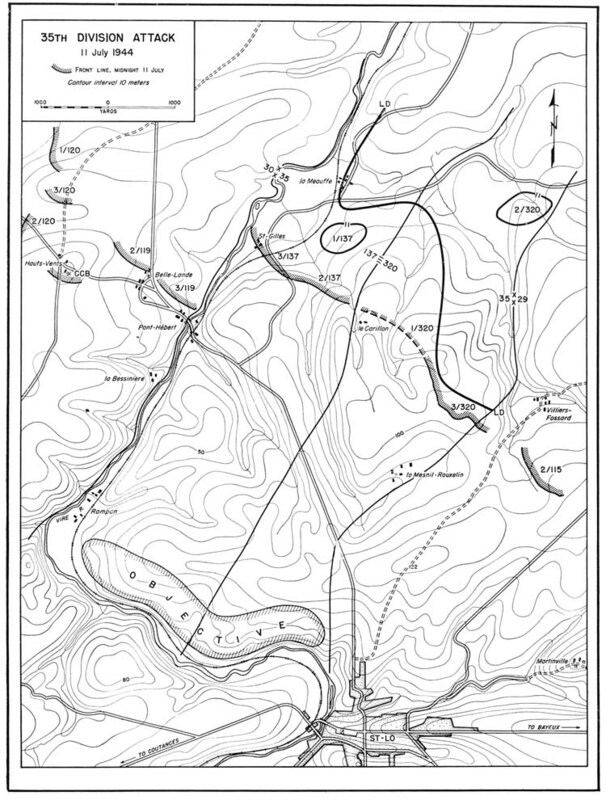 The 2d Battalion had gained more than a mile along the Martinville Ridge, though it was still short of Hill 147. The 3d Battalion had swung south and was on the edge of its objective area, along the St-Lo highway, meeting stubborn resistance. The 1St Battalion was close behind, and a battalion (2d) of the 175Th Infantry was moving down the road toward St-Andre-de-l'Epine, attached to the 116th for the night if needed for protection of the division flank. The 175Th was alerted for movement to attack through the 116th next morning. The 115th Infantry (Colonel Ordway) had been less fortunate during 11 July. Besides having been thrown off stride and delayed by the night attack of the paratroopers, the 115th was hitting squarely at main German defenses and found no weak point in the enemy system, such as that exploited by the 116th La Luzerne was the regimental objective, but it was considered necessary to take Belle-Fontaine first. The 1st Battalion was to come downstream along the headwaters of a small creek on an approach that could outflank Belle-Fontaine. The 3d Battalion was to attack directly south toward Belle-Fontaine, but by order of Colonel Ordway was to wait until the 1st Battalion had moved into position on its left flank. The 2d Battalion, echeloned to the right rear, held defensive positions west of the Isigny highway. Holding as it did a wide front, the 115th disposed of no reserves. The 1St Battalion, aided by the protective fires of the 3d, started its attack about noon. Company A advanced on the left with the mission of taking the high ground east of Belle-Fontaine; Company B, followed by Company C, was to go into the village itself. The battalion met immediately with fierce resistance which continued throughout the day. The commitment of the 3d Battalion did not bring any relief. Early in the evening the 115th Infantry was moving slowly on a 700-yard front, both assault battalions under orders from Division to keep pushing. The 29th Reconnaissance Troop was filling the considerable gap between the flank of the 115th and 116th Infantry Regiments. Division Artillery, commanded by Brig. Gen. William H. Sands, had been active throughout the day, closing the 24-hour period with 45g missions recorded and over 13000 rounds fired. As the evening wore on, General Gerhardt reported to General Corlett that while he doubted whether the 115th Infantry would get far that day, the 116th Infantry would reach its first objectives. "The stuff ahead is pretty stout," he added-and the next week was to prove the accuracy of this report. Nevertheless, the first day's work was encouraging. The 116th Infantry had made a decisive penetration, breaking the German MLR and winning good jump-off positions for a further drive along the axis of the Bayeux-St-Lo highway. The progress here had been greatly assisted by the success of the 2d Division on the immediate flank, at Hill 192.
one mile away from the hill, and had launched a drive halted during the next two days by fierce resistance of the 3d Parachute Division. On 16 June, the 2d Division had tried again, in attack by all three regiments abreast. The 3d Battalion of the 38th Infantry drove the enemy halfway up the forward slope of Hill 192, but was withdrawn when it could not dislodge the Germans from their well dug-in positions. The attacks had cost the 2d Division 1,253 men. Since then, this dominating height had remained a thorn in the flank of First Army's salient toward Caumont. Its tactical importance lay in giving the enemy observation over the whole countryside from the Vire to Caumont, including all approaches to St-Lo, as well as the rear areas of V Corps as far as the beaches. Any successful attack on St-Lo would have to deal with this position. (See Map 10.) 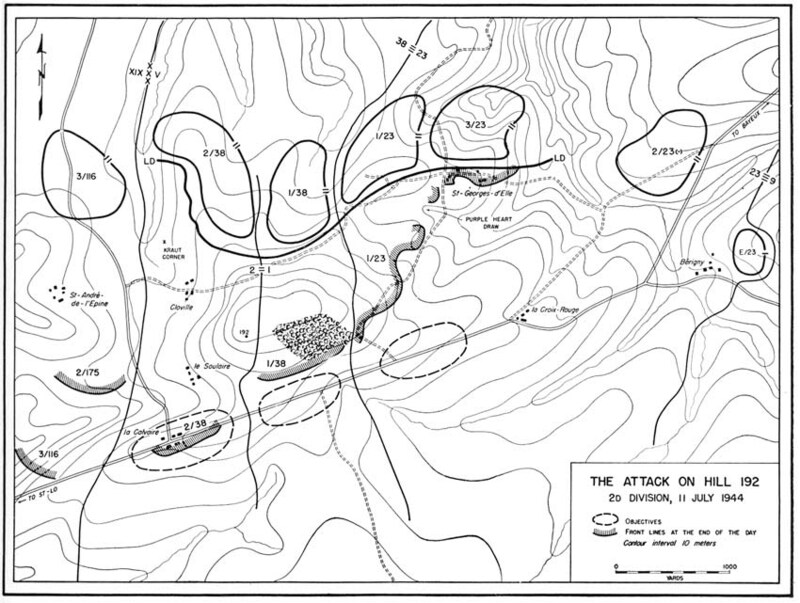 During the period 16 June to 11 July, the 2d Division had worked on plans for capture of Hill 192, whenever attack might be ordered. Intensive training in infantry-tank tactics had been carried through and elaborate preparation for artillery and air support had been made. Artillery fire plans were based on numbered grid squares 100 yards to a side, designed to insure coordination of the supporting fires with infantry advance. corners, and spray the lateral hedgerow ahead to cover the infantry scouts advancing (in this case) along the axial hedges. These scouts would also be covered by BAR men. Two of the four demolitions men followed behind, and the engineers and the leader of the infantry squad would choose the best place for the tank to go through the next barrier. Special EE-8 phones were installed on the rear of the tanks and connected with the tank's interphone system for tank-infantry communication during action. Two engineers would stay with the vehicle to protect it during advance, scanning and firing at side hedgerows to keep down enemy bazooka teams. In the area close to the line of departure, hedgerow embankments were carefully scooped out on the American side, leaving a shell which the tanks could push through on the day of attack. made no attempt to maintain a continuous defensive line, relying rather on a number of strong-points that could support each other by interlocking fires on all gaps. Alternate positions and support positions were prepared to the rear, making possible an elastic defense and the organization of counterattacks. On Hill 192, as elsewhere, the hedgerow dikes made field fortifications easy. Often these embankments were thick enough to allow the Germans to dig in and then tunnel laterally, providing shelter and living quarters for several men underneath the hedge. Nearby fox holes could be dug along the hedgerow, stepped for firing positions. Sunken farm roads crisscrossed the hill, making movement of armor difficult; the only feasible way for our tanks to cross these obstacles-often protected by antitank guns-was to use a dozer to push dirt from the near bank into the road, then cross and cut through the far bank. Four small villages-Cloville, le Soulaire, St- Georges-d'Elle, and la Croix-Rouge-lay on the slopes of the hill, and might be expected to contain nests of organized resistance in the attack zone. St-Georges-d'Elle had already changed hands several times in the earlier fighting, and except for the southern outskirts was now in American hands. South of it on the road leading into the Bayeux-St-Lo highway, scattered farmhouses served as positions for enemy automatic weapons. With plenty of time to map his fires, the enemy protected all important tactical areas by mortars and antitank guns. Heavier artillery, and possibly armor, was located south of the St-Lo highway. The defenses of Hill 192 were manned by troops of the 3d Parachute Division. Initially, the three assault battalions of the 2d Division were faced by two enemy battalions-the III Battalion, 9th Parachute Regiment, which opposed the 38th Infantry, and the I Battalion, 5th Parachute Regiment, a portion of which faced the 23d Infantry. The west boundary of the III Battalion, 9th Parachute Regiment, was the north-south road close to St-Andre-de- l'Epine, close to the divisional boundary between the 2d and 29th Divisions. The boundary between the 9th and 5th Parachute Regiments ran south-southwest out of St-Georges-d'Elle. V Corps' Field Order of 4 July directed its other two divisions, 1st Division and 2d Armored Division, to hold their positions, assisting the 2d Division by strong demonstrations. Artillery support for the main effort was built up on a large scale: the 62d Armored Field Artillery Battalion was attached to the 2d Division; two battalions of the 1st Division and the artillery of one combat command of the 2d Armored were assigned to reinforce the fires of the attack; and Corps Artillery was to render normal support, including counterbattery work. A powerful air strike had also been scheduled, calling for four groups to fly 15-minute missions between H +15 and H +90. With 48 P-47's in each mission, the first two groups were to carry 50 percent white phosphorus and 50 percent HE. 2d Division Artillery was to mark targets for the air strike with red smoke. It was planned to bomb the area 400 yards on each side of the St-Lo-Berigny highway from the vicinity east of la Calvaire to the area south of la Croix-Rouge, and to fly reconnaissance missions south of that highway, from dawn until 1200. Because of limited visibility and haze on 11 July, this air strike was canceled, although one dive-bombing mission was called for by the division commander. On this occasion, the P-47's leveled off too soon and nearly blasted the 38th Infantry. While the target had been marked with red smoke by the 15th Field Artillery Battalion, no further chances were taken with the weather conditions, and all other air missions were immediately canceled. The day cleared up as it progressed, and the main tactical effect of bad weather was the cancellation of the air strikes and the limitation of observed artillery fire. attack with two battalions in column in the general sector of St- Georges-d'Elle-la Croix-Rouge, making its main effort in the west of its zone, on the eastern slope of Hill 192, in order to cross that slope and secure the St-Lo-Bayeux highway from south of the hill east through la Croix-Rouge. The 9th Infantry, on the eastern flank of the division front, was directed to support the attack by all available fires. Because the 38th Infantry line was curved back on the right, Company E on that wing began its attack at H-30 minutes in an attempt to straighten the regimental line. The uneven line resulted from a bloodless advance made on 1 July by the 3d Battalion, 38th Infantry, which pulled a "sneak play." Observing that the Germans on this front were withdrawing from their outpost line (OPL) to the MLR at night, to avoid ambushes by our patrols, the 3d Battalion took advantage of this procedure by a night advance. The move netted 800 yards, without fighting, on the left (east) but only 400 yards toward the division boundary. The enemy made no attempt to retake the OPL. 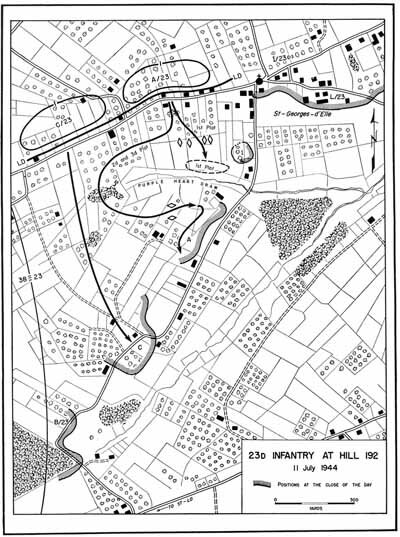 At 0630 the 38th Infantry launched its main assault toward Hill 192, the 2d Battalion on the right and the 1st Battalion on the left, following 100 yards behind a rolling barrage. The regiment was reinforced by two companies of the 741st Tank Battalion, a company of the 2d Engineer Combat Battalion and a company of the 81st Chemical Mortar Battalion. Company E on the right ran into stiff opposition almost immediately, as it tried to reach the small ridge commanding a draw leading up to the hamlet of Cloville. Here was one of the enemy strongpoints, already known as "Kraut Corner," fanatically defended by half a company of Germans who had survived the heavy artillery pounding prior to the attack. The 2d Platoon of Company E tried to work its way up to the first hedgerow in the fields, but was unable to advance because of automatic weapons and mortar fire. The enemy's mortars were registered on the hedgerow lines and blanketed all routes of advance. The 3d Platoon was sent in to give support; a few men succeeded in working their way near enough to the enemy position to throw hand grenades, but got no farther. The defenses of Kraut Corner finally gave way when the 1st Platoon got around the east side of the strongpoint. Scouts streaked along the flanking hedges, supported by BAR's, machine guns of the infantry, light mortars, and the two machine guns on a tank. When eight or ten riflemen penetrated the enemy defense, resistance crumbled, and 15 prisoners were taken. Three paratroopers who still held out were eliminated by a tank dozer which buried them under five feet of dirt. Company E took more than an hour to clear Kraut Corner. To the left, Company F was moving more rapidly against lighter opposition. By the time Company E had passed the strongpoint, Company F had crossed the Cloville-St-Georges-d'Elle road, hitting and turning the weak flank of the enemy. Less than three hours after the jump-off, the left platoon of Company F entered a small wood near the west nose of the hilltop. Company E at this point was a quarter mile behind, trying to enter Cloville. The advance of the 2d Battalion had settled into a frontal field-by-field battle, accompanied by some house fighting in Cloville and le Soulaire. The enemy positions in Cloville had been shelled heavily by American artillery and both villages were badly damaged. Roofs had been blown off, walls shattered, and the streets were blocked by rubble. The enemy infantry, supported by automatic weapons, a Mark III self-propelled 88-mm, and a Mark IV tank, used the cover of the rubble in an attempt to hold Company E in Cloville. An American tank, after a brief fight, knocked out both the Mark III and the Mark IV, paving the way for infantry to move in and mop up the village. An hour and a half was still required before Company E completed this task and could move into the fields south of Cloville. 29th Division. Patrols were dispatched to determine the disposition of the 116th Infantry, and after an hour the difficulties on the division boundary were cleared up. With Cloville taken, the 2d Battalion pushed its advance along the west slope of Hill 192, bypassing the village of le Soulaire, Company E going to the west and Company F to the east. At approximately 1700 the assault units reached the St-Lo-Bayeux highway and the infantrymen began to cross the road one at a time. The tanks were held up because of rough, wooded terrain and the fire of antitank guns and bazookas which covered both the highway and the roads running south from it. They finally slipped across on the left of Company F.
By the end of 11 July the 2d Battalion had organized and was defending the ground along the St-Lo-Bayeux road. It was the only assault battalion of the 2d Division to reach its objective that day, having advanced approximately 900 yards on an 800-yard front. The work had been done by two companies; Company G, which had not recovered from its losses of 16 June, remained in reserve during the day, suffering 17 casualties from enemy artillery fire. The 1st Battalion, 38th Infantry, while not quite reaching its objective, had fought a stubborn battle well past the crest of Hill 192. The right flank of the battalion zone was in the area most strongly defended by the enemy, and the advance here was directly over the hilltop. American tanks in the first assault wave were disabled or forced to withdraw. The commander of Company A, 741st Tank Battalion then reported to Battalion Headquarters that his tanks were unable to negotiate the high ground and recommended that they be committed elsewhere. This was approved by the regimental commander and the tank commander set out to look for alternate routes of advance. Deprived of tank support, the infantry pushed on up the hill, attacking each hedgerow methodically. Light and heavy machine guns were set up behind each hedgerow to spray the one ahead, while scouts went out along the flanks. Under BAR fire support, riflemen gradually worked their way forward to close with the enemy. Company A was halted by one of the strongpoints, a three-sided defense system which the enemy had built around a group of four fields. Approximately two enemy platoons were defending it with rifles, bazookas, and machine pistols. The position was so strong that Company A was unable to gain ground even with all its platoons committed. Company C on the right flank had pushed ahead steadily and by 110 was nearly 150 yards in advance of Company A, which repeated its vain attempts to break the defenses. Thereupon the 1st Battalion's commander committed Company B in the 150-yard gap between Companies A and C. Apparently alarmed by the reinforcement, the enemy withdrew from his strongpoint. By 1330 Company B had reached the diamond-shaped woods just beyond the top of Hill 192; the patches of forest on the hill were dense, but had been riddled by artillery fire so effectively that hardly a tree was untouched. A skirmish line combed through the west part and received only scattered rifle fire. Company C also passed the rest of the hill, helped by effective tank support on its right flank. Considerable opposition had been anticipated in the woods, but they had been so thoroughly smoked and burned with white phosphorus shells and raked with artillery fire, that the enemy had withdrawn all but scattered elements from the area. As a result, by early afternoon the 1St Battalion was working down the south slope of 192. General Robertson ordered the offensive stepped up in order to reach the St-Lo-Bayeux road by 1900. At the appointed time, the 1St Battalion was still 200 yards short of its objective and finally dug in overlooking the road. While the objective had not been reached, the 38th Infantry had continued a steady rate of advance, and there had been no need of committing its 3d Battalion. The left wing of the 2d Division's assault force was the 1st Battalion, 23d Infantry attacking from the road that ran west out of St-Georges- d'Elle. (See Map II.) The 1St Battalion faced terrain which had been fought over in the early attempts against Hill 192, and which contained a draw constituting a serious initial obstacle. "Purple Heart Draw," as it was called, ran for 750 yards east-west along the battalion front, only 200 to 400 yards from the line of departure. It was deep enough to be almost impassable for tanks, and so well covered by enemy fires as to promise heavy losses for infantry who tried to cross. The 1St Battalion (Lt. Col. John M. Hightower), with Company A on the left and Company C on the right, jumped off at 0600, 300 yards from the LD on the Cloville- St-Georges-d'Elle road. Company A did not meet stiff opposition until it reached Purple Heart Draw. Four tanks, stopped by the steep sides of the draw from moving directly across, lined up 50 yards apart on the north edge to support a frontal assault by the 1St Platoon of Company A. The 1St Platoon met with disaster. The enemy, after holding his fire until the greater part of the platoon had reached the bottom of the draw, then loosed mortar and artillery barrages from weapons previously registered on the draw; additional fire came from automatic weapons emplaced in houses along the road south from St-Georges-d'Elle and from the south bank of the draw. The beleaguered American platoon fought desperately and refused to retire. That is, starting from the "withdrawal" line, to which it retired during the artillery preparation. The 2d Platoon of Company A attempted to flank the draw from the west. While the four tanks still fired from north of the draw, two others from Company C, 741st Tank Battalion advanced to neutralize the enemy forces in the houses south of St-Georges-d'Elle. The enemy held tenaciously to his strongpoint, so the 3d Platoon was committed to aid in the flanking movement. This maneuver, and the advance of Company C farther to the west, finally broke the German resistance. Enemy fire from the houses was silenced when the two tanks fired from points 30 yards away, crumbling the foundations. All but 13 men of the 1st Platoon, caught in the draw, were found to be casualties. After this success some difficulty was experienced in turning the riflemen of Company A, now attacking east, back toward the south and in the direction of the objective on the St-Lo-Bayeux highway. The leader of the 3d Platoon was a casualty, but in his place Sgt. William C. Stanley, picking up the remnants of the 1st Platoon in the draw, drove the men forward; they not only pushed out halfway to the objective, but secured the entire left flank of the 1st Battalion in the face of heavy mortar fire. About noon elements of the 3d Battalion started moving up to support Company A. On the right of the battalion line, Company C had moved forward against lesser difficulties. The company employed one variation of the standard tactics it had rehearsed in the preceding week. Fragmentation grenades were fired from rifles, and in two instances these grenades were placed accurately over enemy machine-gun emplacements in order to effect air bursts and silence the enemy weapons. The advance was slowed for a time by troubles in maintaining contact with the 1st Battalion, 38th Infantry on the right flank, but the success of that unit helped Company C during the afternoon. At the end of the day the 1st Battalion, 23d Infantry had gained up to 1,500 yards and dug in for the night 400 yards from the objective, the St-Lo-Bayeux highway. On the east, the Germans still held the lower end of Purple Heart Draw, but only as part of a salient position which would be hard to maintain. Close support by the infantry had prevented any tank casualties, although the enemy had been well supplied with bazookas and sticky grenades. 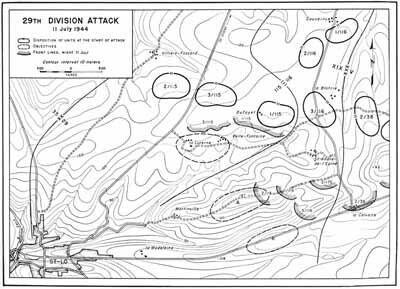 East of the main effort, diversionary attacks had been made during the day by the 3d Battalion of the 23d and by elements of the 9th Infantry. Company L of the 23d put in hard fighting, with severe losses, to gain only one hedgerow to the east of St-Georges- d'Elle. But these efforts helped to keep enemy forces on that sector from shifting troops to the zone of main attack. The drive of the 2d Division, while it had been slowed by stubborn resistance, had packed too much power for the enemy. Fighting to hold Hill 192 and his lines near St-Georges-d'Elle, the enemy committed during the day the 12th Parachute Gun Brigade and then the 3d Parachute Reconnaissance Company. As a last reserve, the 3d Parachute Engineer Battalion was thrown into the fighting. Elements of both the 5th and 9th Parachute Regiments were badly mauled. The 2d Division had taken 147 prisoners, most of them from the III Battalion, 9th Parachute Regiment. Although the enemy was well dug in against the effects of American artillery, it was evident that the tremendous American fire (20,000 rounds for the day on this front) had given considerable impetus to the infantry advance, chiefly in keeping the enemy down rather than in causing wholesale destruction of enemy emplacements. These were too deeply dug and too well protected to be affected by anything except a direct hit. The real battle of Hill 192 had been won by the close of 11 July, since every enemy position on the hill had been reduced and the St-Georges- d'Elle defenses had been smashed. The little work to be done in reaching the final objectives was accomplished quickly on 12 July. General Robertson had ordered a resumption of the advance for 1100. 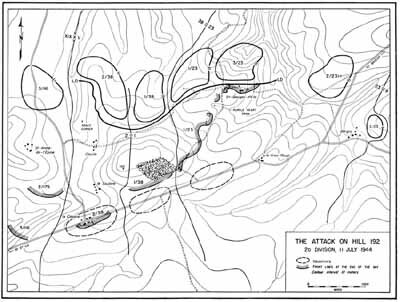 During the night the American positions had been hit with considerable artillery fire, but the small counterattack that followed was ineffective and did not delay the 2d Division's attack. The fighting was much less severe than that of the preceding day. The 1st Battalion, 38th Infantry attacked at 1100 without artillery preparation, as no enemy activity was indicated. Long-range enemy artillery opened fire on Hill 192 and some machinegun bursts were encountered along the St-Lo road, but opposition was light and the 1st Battalion was across the road and on its objective shortly after noon. The 2d Battalion had already consolidated its defenses. The enemy had replaced the battered III Battalion, 9th Parachute Regiment by the III Battalion, 8th Parachute Regiment and had withdrawn to positions south of the St-Lo-Bayeux highway, establishing a new main line of resistance which he immediately began to fortify with obstacles and mines. 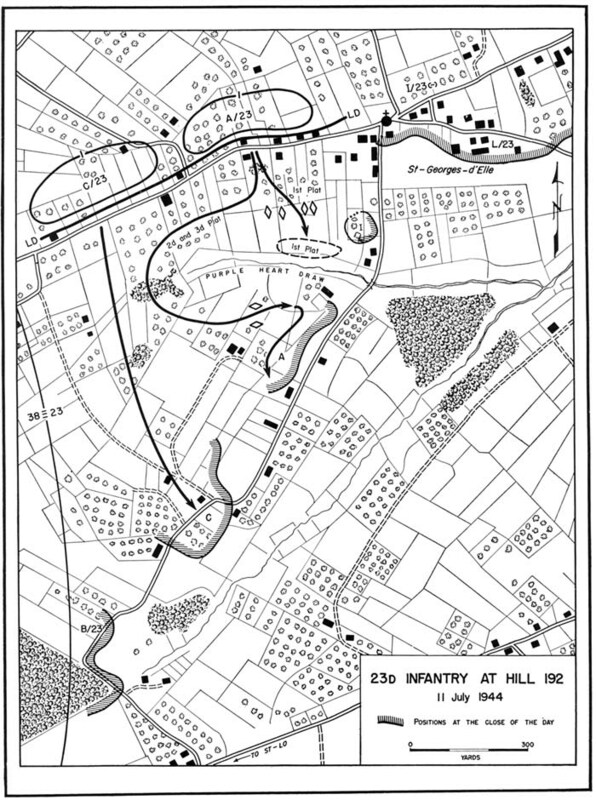 The 2d Division's mission was completed when the 23d Infantry occupied its objective in the early afternoon. The 1st Battalion met very little opposition. The 3d Battalion sent Company K, supported by tanks, to occupy la Croix-Rouge. Resistance had been anticipated here, but the enemy had withdrawn during the night, undetected by the American outposts. The 2d Battalion, late in the day, moved up to a position along the highway, extending the 23d Infantry's line from la Croix-Rouge to Berigny, and clearing out a well-fortified enemy salient. No resistance was met, although the battalion had to pick its way through a heavily mined area. By the end of 12 July the American forces held not only the hill but the St-Lo highway as far west as la Calvaire. Their victory had cost the 2d Division 69 killed, 328 wounded, and 8 missing. The left flank of the main drive on St-Lo had been cleared of a formidable obstacle, and the Americans had gained the best ground for observation on the battlefield. It had probed into that sector on 10 July! see above, p. 25.
that sector. The 320th, on the left, faced a difficult problem in that its front included the sharp angle where the German positions slanted from an east-west line to a direction north-northwest. Since the general axis of attack was almost south, the right of the 320th would be forced to execute a difficult wheel in the course of attacking the German's main line of resistance. And, until the right wing of the regiment made progress, the left (where the main effort was to be made) would find its flank more and more exposed by any advance made southward against the base of the enemy's L-shaped line. This tactical problem was to complicate the first few days of battle for the 320th. After a night in which enemy artillery had been very active, particularly near the river, the 35th Division jumped off on schedule at o600. The 137th, attacking with two battalions, lost its commanding officer almost immediately when Col. Grant Layng was wounded by a machine-gun bullet. All along the front the assault units met heavy machine-gun and mortar fire, reinforced by medium artillery and 88-mm guns. After good initial progress, the 1st Battalion was stopped for the rest of the day in front of St-Gilles, where the enemy strongpoint included a fortified church. The approaches to it were covered by machine guns firing from concrete emplacements and through holes in the church and the cemetery wall. The 1st Battalion got to within 50 yards of this position and then was pinned. At 1830 the 3d Battalion was committed, but in spite of a pounding by Division and Corps Artillery the strongpoint held out. Farther east, the 2d Battalion met equally stiff resistance in front of the German MLR. Against the 2d Battalion the Germans then and next day employed tactics which were often successful in hedgerow warfare. They tried to stall advancing units along lateral hedgerows by fire from automatic weapons; then, if the attackers allowed themselves to be pinned down, waiting for support of artillery or tanks, the enemy would blanket the lateral hedgerows with deadly mortar concentrations. The 320th Infantry had similar bitter experience in its opening day of hedgerow fighting. The worst mischance befell a platoon of Company E, 320th Infantry, which the Germans fooled by a fake order into withdrawing into a concentration of enemy mortar fire; the platoon lost all but 14 men. Both attacking battalions found communications a particularly hard problem, since few field radios remained intact, and wires were cut by enemy fire. The 1st Battalion, on the right, managed to push far enough to straighten out the regiment's front on a northwest line. On the whole, little progress had been made on the opening day by the 35th Division. The effects were felt across the Vire, where the 30th Division's attempt toward Pont-Hebert was increasingly harassed by enemy fire from the St-Gilles salient. That is, the diversionary actions by U.S. V Corps. Army to give it the 14th Parachute Regiment (5th Parachute Division), from army reserve. But on 11 July, Seventh Army had too many problems elsewhere to commit its only reserves, which in any event had not yet arrived. Divisions, had responsibility for the sector north of St-Lo. Here, defensive successes could be reported for 11 July. But Seventh Army was aware, from a captured order, that the American main effort was being made along the St-Lo-Bayeux highway, and had no illusions about the seriousness of the threat from that quarter.